Alcohol is a contributory factor in nearly a third of all drownings. 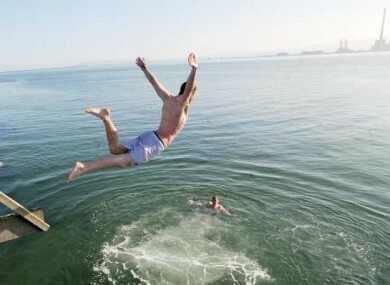 THE RECENT SPATE of good weather has seen a huge increase in the number of people flocking to the water to cool down. The country’s beaches, rivers and lakes are a popular destination when the sun comes out but just because it’s relaxing to dip in the water – doesn’t mean you should relax when it comes to your safety. Irish Water Safety is urging people to take precautions as an average of 140 people drown in Ireland every year. Forty children aged 14 and under have drowned in the space of ten years. IWS says that 80% of the drownings happen in the victim’s local environment. People drown silently, quickly and sometimes in only inches of water. They can drown beside others who are completely unaware. Children are particularly at risk and need constant supervision. Meanwhile Drinkaware.ie is reminding everybody that alcohol and swimming don’t mix. Alcohol consumption is a contributory factor in nearly a third of all drownings in Ireland each year. Alcohol slows down people’s reaction time, impacts their coordination, and affects their perception of distance and direction and when it comes to water-sports – this can be an extremely dangerous combination. Fionnuala Sheehan, chief executive of Drinkaware.ie says “it’s really important for people to know what a standard drink is and how long it takes for it to leave your body. This isn’t a message just for when you’re getting behind the wheel of a car. “There’s approximately one standard drink in a glass—not a pint—of beer, lager, or cider; a small glass of wine; or a single pub-measure of spirits. On average, it takes about an hour for the body to process a standard drink. Parents are being warned that a drowning can happen in less time than it takes to answer the telephone or tend to another child. Water Babies, which offer swimming lessons to babies, warn that the combination of holidays, sunshine, water and children can be a lethal combination. We all look forward to getting away from it all, chilling out and letting our little ones splash around. And parents tend to relax and gain a false sense of security for children in a holiday setting, when in fact they should be more attentive than ever. Sadly, a primary factor in cases of fatal drowning is down to the initial shock, when a toddler or child falls into the water. McNally explains that “very young children react instantly and adversely to sudden and unexpected submersion and are temporarily paralysed with fear”. Water Babies primary goal is to teach babies vital lifesaving skills, such as swimming and holding on to the nearest solid object or turning onto their backs. If leaving, even momentarily, take your child or designate a known adult to supervise – never leave an older sibling in charge around water. McNally says that “over the years we’ve been incredibly proud to share the credit for having helped save a significant number of children’s lives. Water Babies have fallen into canals, swollen streams, private swimming pools – and survived, thanks to the skills they learnt with us. Email “Think before you jump in, 140 people drown in Ireland every year ”. Feedback on “Think before you jump in, 140 people drown in Ireland every year ”.